So the crew and LFB are safely into San Jose del Cabo Marina. As our Nordhavn friend had predicted, they always have room in that Marina. The Marina was very well done, great slips and great support. With a tropical storm brewing along the south pacific coast it looked like the team was going to be there for a while . . . Great, because we had some work to do. LFB was running fine at cruising speed but showed signs of running too hot at Wide Open Throttle (WOT), which we like to do for a stretch every day to burn out some of the residue in the exhaust stack. Also, the large engine room blower had died and the engine room was way too hot. Interesting that the blower that broke looked ok, the smaller blower that looked rusted out (and that we had talked about replacing but had not) ran just fine. (That blower would work all the way to Florida, where we finally decided to replace while the conditions were good). We had ordered parts and they were sitting in the triad portion of North Carolina. Now we just had to get them to Mexico. One of my sisters-in-law is an executive with an international furniture company so we first turned to her shipping department. The news – likely to take a week and cost a ton of money. And it was not clear that once the parts actually arrived in Mexico that customs clearing would be done quickly or at a reasonable cost. 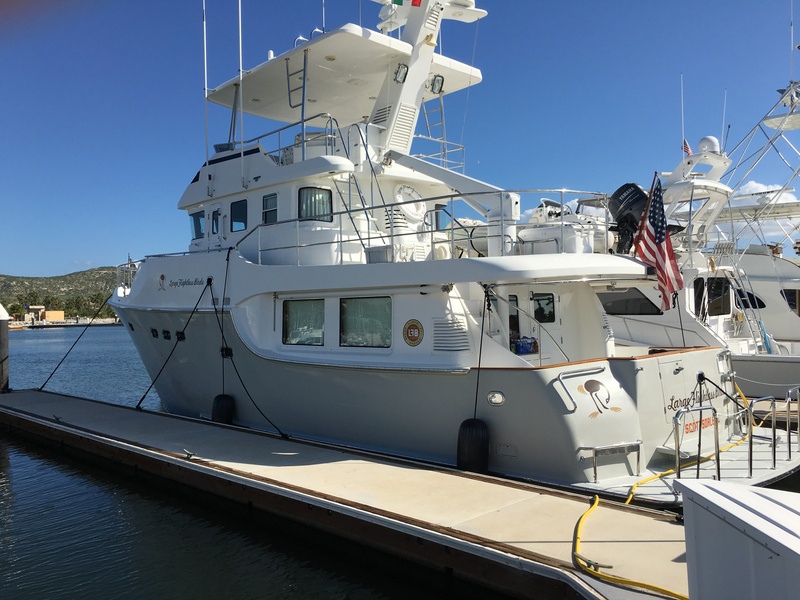 We knew from some conversations on the Nordhavn Owners list that since we had our Mexican temporary import documents for the boat that if we hand carried the parts we should be able to clear customs with no delay and no additional duty. So now all we needed was someone to act as courier . . . Somehow The Great Auk drew the short straw and so a roundtrip between NC and Mexico was in the cards. Picked up the parts in NC, and got everything nicely packed for the trip to the airport in Cabo. Late Friday night I got a call from American Airlines, a storm screwed up the airport in Dallas and my flight was canceled. After some back and forth with the Executive Platinum desk I found myself on a flight from Charlotte to Los Angeles, with a connection to Cabo San Lucas. Texted the team about my new arrival time and headed to Charlotte. 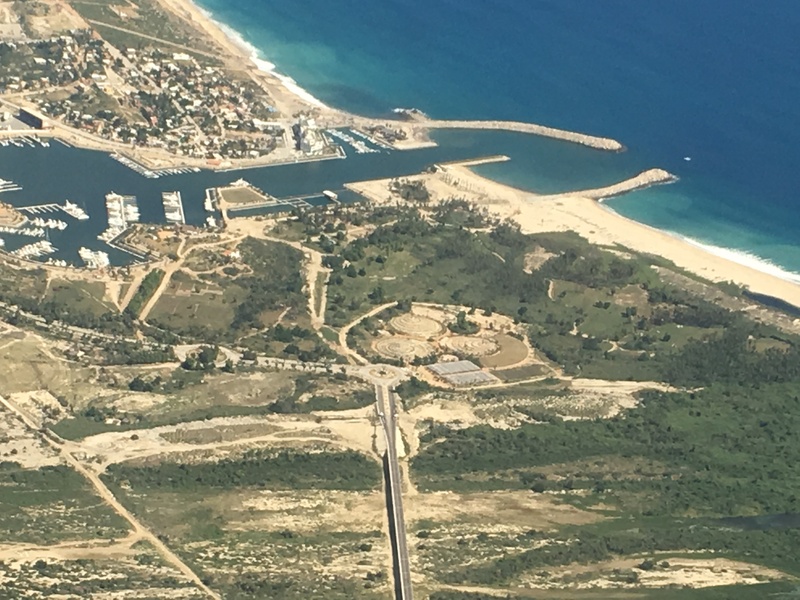 The flights to Cabo went well, but arriving around noon on Saturday at Cabo during the season is not recommended. I had two unpleasant surprises. First, I found myself in the back of a very long line, took me about 1 3/4 hours to get to the front of the immigration line. I picked up the luggage, including the very large box with the engine blower and headed to clear customs. That line was shorter, only about 20 minutes. But when I got to the front of the customs line I found myself face to face with a trainee who insisted, despite all my import paperwork that I was going to have to pay customs fees on the boat parts. After repeating again and again my position I was shuffled off to another line to have the goods inspected and paid for. When the supervisor approached I showed my paperwork and the supervisor went nuts. Wanted me to point out the individual who had sent me over. She grabbed the poor trainee out of line, yelled at him for a while and then dragged him over to me where he apologized for the mix-up. Made a new friend, I hope he quickly forgets what I look like. I gathered my stuff and finally headed out to the arrivals haul, 2 hours and 15 minutes after I deplaned. Oh joy. 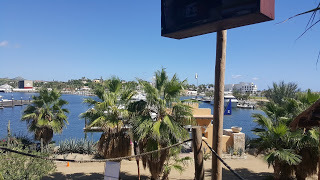 My brother met me in our rented jeep and as we drove back to the marina told me that the Annual Cabo Iron Man Triathlon was running that Sunday. We arrived at the Marina and took the boxes and parts to the boat. First order of business was to replace the engine room blower, which our engineer did with little fuss. After testing the work we headed to the bar in the marina to have a few refreshments and relax. While we were there we noticed what looked like mile markers being set up on the path that runs between the waterfront and the marina bar. Turns out that the marathon portion of the race was going to run right down the waterfront by the marina, completely shutting down traffic and services in the Marina on Sunday. That created an issue, because we had to get back to the airport Sunday, and the crew had some provisioning to do. In this picture you can see the traffic cones indicating the course for the runners. While this was going on we watched the weather report, the forecasted storm along the pacific coast was quickly morphing into Hurricane Patricia which was soon labeled the second-most intense storm on record anywhere. And it appeared to be heading our way. Oh joy. 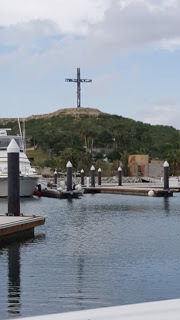 Perhaps the cross overlooking the marina would provide some protection. It appeared that our urgent need to do some provisioning was now not so urgent; we were not going anywhere until the storm had cleared. So the crew settled in for a few days, exploring the area, drinking lots of margaritas and beer and waiting for mother nature to give the go sign. Along the way one of the crew made lots of friends. We printed up t-shirts for the trip to be used as gifts. 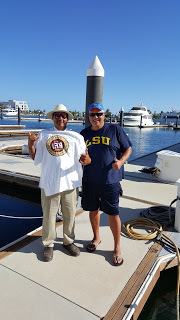 Here is our chief cook and designated fisherman with one of the gentlemen from the Marina who provided terrific support.